Optoma HD33 review | What Hi-Fi? Feast your eyes on a three-dimensional cat among the 2D projector pigeons. We’ve already seen one knockdown 3D solution from Optoma in the shape of the HD67N, but that involved an external 3D conversion box. This is the company’s most affordable one-box 3D solution. 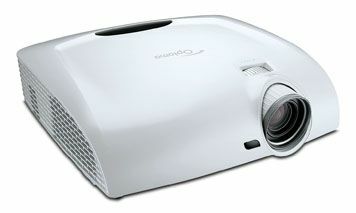 And it’s not just the price that will turn heads – this projector also comes with wireless 3D-RF glasses. Optoma hopes it will make for a more robust connection, plus prove capable of brighter and higher-contrast images. You’ll get one pair of glasses in the box as well as all the necessary cables and the transmitter. Extra RF glasses will be £80 a pop, while the HD33 can also work with DLP Link specs. Elsewhere, our features list gets a thorough ticking. The Optoma HD33 is a DLP projector, has a 1080p, 1920 x 1080 resolution, two HDMI inputs, and impressive claims of 1800-lumen brightness, and a 10,000:1 contrast ratio. Focus and zoom controls are manual but work well enough and in tandem with the lens controls we’re soon up and running, with the HD33 proving fairly quiet in operation, which is a bonus. The 3D glasses prove light and comfortable and more crucially, picture performance is excellent. Delivering some of the best-value 3D pictures we’ve seen, it’s clean, largely free of crosstalk and capable of an impressive sense of depth. Comfortable to watch, we find ourselves relaxing and enjoying the 3D content that we cue up.Thumbs-up, then. The bread and butter is, of course, the 2D image, which is bright, colourful, clean and smooth with motion. Only the best budget boxes around delve deeper for a smidgeon more detail. It’s a head-turning price for a 3D projector but it would be nothing if the performance didn’t match up. Fortunately, we’re in luck. If you want to take your first, affordable step on the big-screen 3D ladder, look no further than the HD33.